Who does not want to look fabulous? Mostly with those accessories that can be used as our own desire. Thinking! Well there are n numbers of them, but today we are here with a specific accessory to be worn by anybody-type if chosen correctly. Belts, one of the formal as well as informal wear and the best accessory to your body curviness. If you think that you will look the best with a belt, than the only magic trick that works is knowing what would work with your body figure. There are different types of belts available and in different styles and patterns too. What is the key point is thin belts gives you more elegant and smart feel while those wide belts helps you showing the curviness of your body. Wear belts as a part of styling or if necessary. There are various ways of styling belts. Those who are skinny should try those wide belts as that help them to show the curves and the best way to wear them is under the diaphragm giving a unique contrast to your dress and highlights your waist. If they want to have a smart feel than they can go for skinny belts with a pair of leggings. Try to go for plain or simple designed belts this helps in creating contrast in your outfit. Wide belts go the best with harem pants or pleated skirts. You can even try those big buckles to have a different look. Not so necessary that the belt buckles should stay in the middle, you either wear it sideways or even at a 45 degree angle. 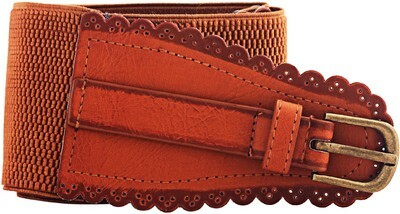 Woman having plus size should try out this kind of wide belts and not those skinny ones. Some of us might be confused that what belt can be worn with what kind of dress. As those skinny belts give you some sort of formal look too you can wear them with blazers, while those wide belts whether with bow or without bow can be worn over short skirts or knee length one piece, those skinny gormet belts can be worn over pleated skirts. To know more about belt styling keep reading and if you have found any unique styling do share with us !